November 7th marks is 95th anniversary of the Russian Revolution. 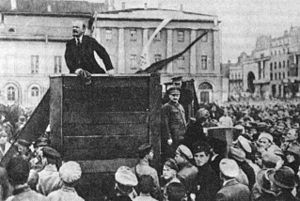 Led by the Bolshevik Party, the Russian Revolution was the first clearly proletarian revolution in which state power was seized, reactionaries vanquished, and socialism built among the hardships of civil conflict and imperialist aggression. Though the history of the Soviet Union, which the Russian Revolution founded, was beset with difficulties, it nonetheless remains part of the positive historical experience of revolutionary struggle against capitalism and for communism. Thus, November 7th will forever be marked as a day for remembrance and advancing the struggle for proletarian revolution. Be sure to check out our Russia Category. 7 January 1970. It’s warm and bright, and there is a lively and festive atmosphere in the “House of Rest” where the veterans of the “Great Years” of the world revolution spend their days. The veterans decided that on the day that had once been Christmas Day they would recall their childhood and youth by decorating a tree. A real fir tree just like in the years before the world upheavals. The young children and the older girls and boys were enthusiastic about the idea. Especially when they heard that “red grandmother” was going to tell stories about the great years of 1917. There was no problem in getting the tree. They came to an agreement with the man in charge of forestry conservation, persuading this vigilant guardian of the plant kingdom that the forest would not be ruined by the loss of one tree stolen for such a strange and unusual festival. The candles were more difficult. The new method of lighting, using reflected light rays, had not only done away with kerosene-wick lamps once and for all, but had banished electricity to the far distant provinces where the latest innovations had yet to be introduced. The younger generation had never seen candles, and the veterans of the “great years” had to explain them with the help of diagrams. A special conference of people who had been members of the people’s economic council during the revolutionary period was called to discuss the ways of producing the candles. The young people, with their clever heads and clever hands, were there to help. After a number of failures, misunderstandings, and unexpected difficulties, they managed to decorate the tree with paper decorations of various colors, with candies, nuts, sweet juicy oranges, rosy apples and home-made candles in home-made candle holders. The veterans and the children were unanimously of the opinion that the Commune Ten had not seen such an original and interesting festival for a long time. The young people enjoyed themselves as the young have always done. They laughed and joked. There were songs, games, and dances. But you had to take one look at the girls and boys to see how they differed from the young people who had fought at the barricades during the “great years” and from those who had lived under the yoke of capitalism. The young people of Commune Ten were healthy, their bodies were fine and supple and strong. The girls had long, luxurious plaits which they arranged carefully. For the commune strictly followed the rule that every member should have time for relaxation and the care for his or her person. The communards loved beauty and simplicity, and they did not force or distort nature. The young men dressed in attractive clothes that allowed for free movement. Their hands were obviously strong and able. There was not one sick, pale, or exhausted face among all the yond people who had gathered for the “fir-tree” festival. Their eyes shone brightly and their bodies were strong and firm. Their happy laughter filled the bright, festive hall, and that was the most joyful change of all. The young people of Commune Ten loved life and loved to laugh. They only frowned when it came to battling against the only enemy, nature. However, they did not frown because the struggle was not to their taste, but in order to concentrate better and chose the best way to win. The struggle of men and women to control their environment was still in progress. The more victories they won, the more mysteries there were to be solved. But the young people were not afraid of the battle. What would life be like without struggle, with the need to stretch the mind and strive forward towards the unknown and the unattainable? Life on the commune would be dull without it. The life of the commune is organized in the most rational way. Everyone has a profession and everyone has some favorite pursuit. Everyone works at their own vocation for two hours a day, contributing in this way to the running of the commune. The rest of the time the individual is free to devote his or her energies to the type of work he or she enjoys-to science, technology, art, agriculture or teaching. Young men and women work together at the same professions. Life is organized so that people do not live in families but in groups, according to their ages. Children have their “palaces,” the young people their smaller homes; adults live together communally in the various ways that suit them, and the old people together in their “houses.” In the communes there are no rich people and no poor people; the very words “rich” and “poor” have no meaning and have been forgotten. The members of the commune do not have to worry about their material needs, for they are provided with everything: food, clothes, books and entertainment. In return for this the individual provides two hours’ daily work for the commune, and the rest of the time the discoveries of a creative and enquiring mind. The commune has no enemies, for all the neighboring peoples and nations have long since organized themselves in a similar fashion and the world is a federation of communes. The younger generation does not know what war is. The young people insisted that the veterans of the “great years” tell them about the battles between the Reds and the Whites. But the veterans were not anxious to talk about the war on the “day of the fir tree.” They thought it more appropriate to speak about the leaders of the revolutions. They promised to begin the stories when the candles had burned low and everyone had been given their sweets. The young people hurried to bring the glass trolleys into the hall. The sweets the liked so much were laid out in gaily colored, artistically decorated bowls. The sooner we’ve had our sweets and the candles on the fir tree have finished burning the better, thought the children. But the veterans watched the lights burn low with a sense of sadness. The candles remained them, it is true, of that old and long-forgotten system of capitalism which they had so hated in their youth; but the past had been ennobled by their great striving for progress. Their dreams had been fulfilled, but the life was now passing them by and their old limbs could not match the bold flights of the young people. Much of the life and many of the aspirations of the young people were incomprehensible to them. And they all laughed at the strange past. The veterans of the revolution somehow felt awkward and embarrassed about the past, when there had been capitalists and thieves and money and ladies. The last of the candles flickered out, and the trolleys were rolled to one side. The young people gathered impatiently around the story tellers. The young people of the world commune are turn their attention to the cosmos; the sky beckons them. They do not understand the grandeur of the old struggles. They cannot appreciate either excitement or the fears and anxieties of the past. The eyes of the young people showed surprise and sparked with reproach and bewilderment. Life was sacred. “We were fighting for our lives, though. We sacrificed everything for the revolution,” red grandmother said in justification. “Just as we dedicate ourselves to the commune,” was the proud reply of the young people. Red grandmother fell silent. Life had forged ahead. The “great years” were now only history. The younger generation could not respond as they had done to the stories of the worldwide barricades and “the last fight.” The social question was settled. The ideas of communism had justified themselves. Mankind was free from the slavery of backbreaking work for others, from material dependence and from the struggle for daily bread. New and larger problems confronted humanity, challenging the search and dauntless sprit of men and women. In comparison with these horizons, the previous struggle against social forces seemed to the young people of 1970 and easy question. “Hunger? You went hungry? You must have been very unorganized and ignorant. “Ignorant,” “unorganized” – the young people could pass no sterner judgment on red grandmother’s contemporaries. The young people held their heads high, facing the future boldly. They turned their eyes to the stars and the dark blackcloth of the sky, visible through the wide windows of the festival hall. “You achieved your aims, and we will achieve ours. You subdued the social forces; we will subdue nature. Sing with us, red grandmother, the new hymn of the struggle with the elements. You know the tune. It is your own ‘International,’ but the words are new. They call us to struggle, to achieve things, to move forward. Let the fir-tree burn out. Our festival is in front of us. Our festival is a life of endeavor and discovery.